a book chick: "a primate's memoir"
my take: our book club loved this ... everybody had something to say and everybody read it! as a fan of memoir, a fan of an earlier work (why zebra's don't get ulcers), and one who's travelled to Kenya, this was right up my alley. although, i have to admit, there were a few nights it put me to sleep (maybe the small print? or old testament baboon names?) ... for an insomniac this is actually a plus in a book selection. 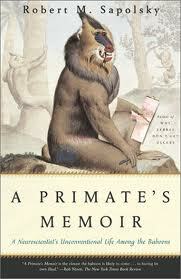 sapolsky is a great story teller, and he regals with stories of a baboon troop and his own travels around Africa. seriously, for a neurobiologist, this guy is fun and funny.... a hippie who's doing really important brain research. a documentary about stress & his research is worth a watch ... "stress~portrait of a killer" shows him and baboons. my verdict: great science-y/adventure memoir. This is a surprise delight. I read it, Joel read it, Maggie's reading between study sessions for orgo. Having stayed in a lovely "green" camp outside Kruger (Umlani Bush Camp) i did wonder about the negative impact we had ... I recommend this book to a lot of friends.